The NSA/PRISM story has mostly devolved into the Snowden road show now. Bolivian planes are being searched, countries are pondering over asylum claims, but underneath the drama there have been some interesting revelations. It turns out George ‘Dubya’ Bush Jnr. was the instigator of the whole project (and proud), while Snowden was actually a lot higher up than first thought; not so much a “technical assistant” as an international hacker, the US army are now blocking all coverage on the story within its ranks, and there have been online and physical protests to coincide with Independence Day. It’s also worth noting that all through this saga, in stark contrast to the Silicon Valley troupe, the telecoms companies have stayed almost completely silent. It also turns out France has its own surveillance program with trillions of metadata elements, while a report by the Serious Organized Crime Agency shows that companies are regularly hacking each other to get at their precious data and trade secrets. With all this espionage going on, a James Bond story with a surveillance theme must surely be in the works by now. Or at least you should be put off Cloud computing. Yahoo! Keeps Dishing The Cheques Out! Marissa Mayer may have an addiction. This week saw the deals for Xobni and Qwiki go through, and has also acquired mobile-app startup Bignoggins for an undisclosed amount. No one is sure, but this shopping spree could go on for a while thanks to all the billions the company has stashed away, but what is the eventual aim? Become a mobile monster? A social machine? An all-in-one web portal? Some are worried the desire for talent will lead to many of these apps going the way of the Dodo. Google finally retired Google Reader this week. The company cited a dwindling amount of users, but it’s clear they just wanted to push them onto Google+ instead. Luckily for the people that were devoted users - which even to the end actually numbered in the hundreds of thousands - the void is full of other viable options (I am now a devoted Old Reader user). What people didn’t expect is that many of them are crashing due to the suddenly increasing demand. Still seems like a bad move on Google’s behalf, but will be a definite gain for plenty of other companies. In other Google-based news, Google+ ‘+1s’ are growing at a faster rate than Facebook ‘Shares’. According to Searchmetrics, in the US Google+'s growth in shares was 19% per month while Facebook's shares only grew by 10% between November 2012 to April 2013, and the former would overtake the latter by 2016. A nice dream, but I don’t see it happening - only 24.39% of Google+ users had any kind of posting activity whatsoever on their profiles, and the saturation point is likely to be much lower since, at least in my eyes, it doesn’t do anything better than the other social sites. And finally, the cheeky beggars have ignored all the controversy about their tax payments (or lack thereof) and actually announced they’ve paid too much and want an $83.5m refund. I’ve generally tried to avoid all the tax palaver since it’s less tech and more finance-based news, but you have to admire their cojones. The era of wearable tech is almost upon us. The Pebble smartchwatch is now available online. Sony, Foxconn, Samsung and even Dell are getting in on the action. But the one that consumers will inevitably be waiting for, Apple’s iWatch, may be a step closer to reality. Trademark applications under the name have been made in Russia, Japan, Colombia, Mexico, Taiwan and Turkey. However there may be a few sticking points; in the US the name is owned by OMG Electronics, and by Probendi in the EU, while in China it’s also complicated. Claiming the names should be ok once enough money has been thrown at the problem, but by then the rest of the market could’ve staked their claim. Plenty has been going on in the mobile world. CTOs of leading mobile operators expect to be promoting a “5G” network within five years, according to Telecomasia, the first Firefox OS phones have started shipping in Spain, and one analyst has said that Nokia is doomed and its only chance for survival in the future is to embrace Android for its bottom-end phones. Not sure about 5G or ‘Andoidika’, but stranger things have happened. There were two big surprises this week. The first was Blackberry’s quarterly earnings, which were painful to read and featured an $84million loss. Experts had been hopeful and expected well over 3 million BB10 devices to have been sold, but the actual number was 2.7 million, causing shares to drop 20%. This was meant to be the company’s golden moment to announce its return from the edge, and justify Thorsten Heins’ comments about BlackBerry becoming the absolute leader in mobile computing in five years’ time. Instead we got a damp squib and advice that Blackberry should move away from devices and concentrate on Mobile Device Management. Probably for the best. The other big news of the week was HP’s announcement that they were moving back into the smartphone market. “It would be silly if we say no,” said Yam Su Yin. “HP has to be in the game." No details on a timeline, device, or what it OS it would run though. HP has a tablet running Android out, but also has close ties to Microsoft, so could exploit that instead. One thing is for sure; Former Palm CEO Jon Rubinstein will be standing by his claim that selling his company to HP was a waste. It’s been a busy week for Bitcoin. This week was London’s first Bitcoin conference, which included talks on “Why Iceland should use Bitcoin as its national currency”, but it also featured a nifty ATM which converts your cash straight into the cryptocurrency. While obviously the conference was bound to mostly talk about the wonders of Bitcoin, the ATM could be a great way to boost adoption, as could a new patent. Douglas Feigelson is in the process of patenting his Bitbills, physical representations of your Bitcoin stash. They preceded the classy looking Casascius coins but there are some worried about the patent hindering innovation in the field. But as much as they might dislike it, Bitcoin is growing up. The exchange site Mt. Gox has registered as money service, and is looking to get all the right paperwork to continue as such, while the Winklevoss Twins – owners of around 1% of the world’s coins, worth around $9-10 million - are looking to create a Bitcoin investment trust. All sounds very business-like and not in keeping with its anarchic nature if you ask me. Bebo is back! Well sort of. Much like 2005 rival Myspace, the social network has been sold yet again, but this time back to its original creators for $1 Million. A snip when you consider they sold it for $850 million five years ago. Hopefully they’ll take pity on it and put it to sleep and not try anything silly like resurrect it. An in a wonderful piece of fantastic news, a French company have developed an analytics tool that detects sarcasm. How delightful. The company, Spotter, claims its clients include the Home Office, EU Commission and Dubai Courts, and has an 80% accuracy rate. Almost perfect. Genuinely (honest) not a bad way to earn £1,000 per month, eh? “Bad dog! Stop chewing my iPhone!” If this is a phrase you’ve uttered more than once, your device could be one of the millions of pieces of devices that get eaten by cats and dogs. A new survey by warranty company SquareTrade Inc. found 2/3 of pets have eaten their owners gadgets, 1/6 have vomited beenon by furry friends, while almost 1/5 of owners have dropped one because of lunging animals. 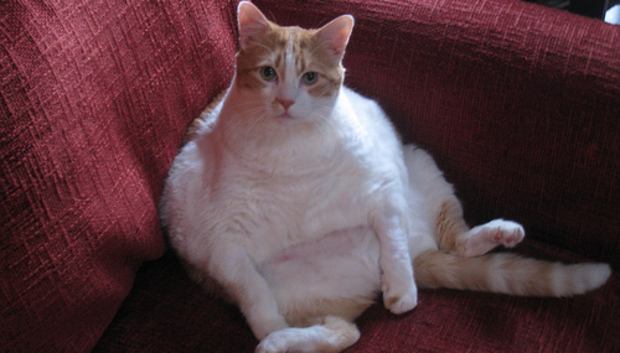 The report also found fat pets are more likely to ruin your devices.